Fracking has boomed in recent years. Adi Gaskell demonstrates how drones are being used to monitor gas leakage levels. I have written a few times recently about the growing use of drones to provide monitoring services, whether it’s to help navigate the oceans, monitor glaciers or even entire ecosystems. In each of these projects, the drones provide an effective and low cost way of tracking large distances. 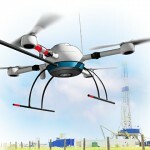 It’s perhaps no surprise, therefore, that a new drone is being deployed to track and monitor fracking sites in the US. The shale fracking industry has ballooned in recent years as the US have opened up their market to the new method for extracting gas from the ground. It’s believed that around 2% of this gas is lost through leaks, with this contributing significantly to climate change. The drone will be equipped with a methane detector to provide continuous monitoring for gas. The aim is to provide this service significantly more cheaply than manual checks. What’s more, if the device detects methane then it will search the site for the source of the leak. The device is being developed by Physical Sciences Inc. and will feature monitoring technology from a consortium including Princeton, the University of Houston and Health Consultants Inc.
It’s hoped that the drone will be able to provide round the clock surveillance of a site, therefore both enhancing the safety of the site but also improving its green credentials. Whilst the likes of delivery drones are gaining a lot of publicity, it seems likely that using the technology for things such as this will be much more feasible, certainly in the short-term.